In many areas, water tables are lowering, causing wells to run dry, saltwater to intrude inland and leaving an increasing number of people without a reliable source of life-sustaining water. As populations continue to grow and shift, it is imperative for all aspects of the water cycle to be optimized for sustainability. Historically, water scarcity was limited to the arid west. However, water resource concerns have been occurring in non-historical locations. One cause is centralized wastewater infrastructure; water is drawn from an aquifer, then consumed and discharged a great distance from the source, thus short-circuiting the natural water cycle for aquifer replenishment. In addition, each wastewater district may have thousands of miles of piping for collection — and the piping system, consisting of old and new pipes, is far from watertight. Through the process of inflow and infiltration there is an additional vehicle by which aquifers are depleted. Water supply wells for municipal water systems can also deplete aquifers. These activities, coupled with lean rainfall amount, and in some cases, drought conditions, are extracting a water resource toll in unexpected areas. Artificial aquifer recharge (AAR) is a growing method of water table stabilization and water supply in the United States. Conventional methods of AAR include using recharge basins and injection wells to convey water directly into the aquifer. However, when adequately designed and installed, decentralized wastewater systems have the capacity to discharge large quantities of wastewater into the underlying soils, making it one of the most passive, sustainable forms of AAR. Decentralized systems provide both wastewater treatment and groundwater recharge in one step. A growing number of cities and towns across the U.S. are turning toward decentralized wastewater treatment for groundwater recharge to prevent saltwater intrusion. The United States Environmental Protection Agency (EPA) defines aquifer recharge as, “… the enhancement of natural ground water supplies using man-made conveyances such as infiltration basins or injection wells.” As currently defined by the EPA, aquifer recharge systems are typically used in areas with limited ground or surface water availability. The keys to effective decentralized systems adequately accepting wastewater into the underlying soils include soil type, distance to the limiting layer, proper siting, installation and maintenance. In the past, many of these factors led to sites being connected to a centralized sewer; however, as technology continues to advance, more sites have become viable candidates for decentralized systems. These decentralized systems are increasing the volume of groundwater recharge critical to maintaining a healthy water supply. Still, centralized sewer replacement, expansion and separation continue to be the focus of federal funding and new development. The funds distributed through the Clean Water Act State Revolving Fund are largely biased toward centralized wastewater management programs despite the fact that approximately 25 percent of all homes currently use decentralized wastewater management. While traditionally thought of as a single-home wastewater treatment solution, decentralized systems can be built to treat any volume of wastewater. Community decentralized systems can be designed where individual site conditions limit the use of soil-based treatment systems. Large systems can also be developed for large flow commercial and industrial sites where nearby centralized systems are often too small to accept the total volume of wastewater generated. These large publicly- and privately-owned community systems are now being managed in the same manner as centralized systems. 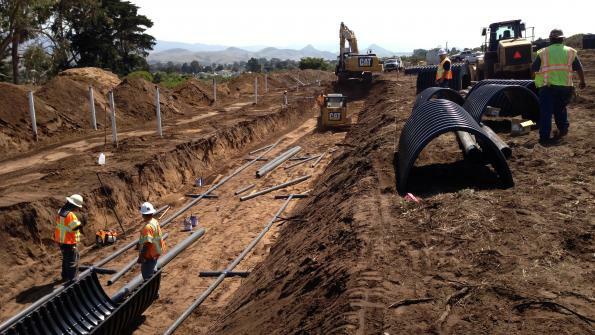 Los Osos, Calif., had a long struggle in choosing the direction for wastewater treatment. The coastal community had met its wastewater needs with on site wastewater treatment systems that were outdated. As urban core density increased, code-sized systems could not fit the small lots. With existing systems far exceeding their design life, the Regional Water Quality Control Board declared a prohibition zone that included a building moratorium. To make matters worse, the agricultural community was experiencing saltwater intrusion as groundwater was pumped to meet agricultural and potable water demand. Because the city was concerned that the initial study’s recommendation to use an ocean outfall for a centralized wastewater treatment system would exacerbate saltwater intrusion, it chose a decentralized solution. That included final discharge to a community drainfield, recharging the groundwater supplies to minimize saltwater intrusion. The completed large community treatment system has a capacity of a capacity of 1.6 MGD and includes collection, conveyance, treatment and recycled water reuse. Decentralized wastewater treatment can provide equal or better protection of public health while outshining centralized wastewater treatment in environmental protection. Decentralized systems provide a low-cost, passive form of both wastewater treatment and aquifer recharge, combatting the declining groundwater table and protecting public health. Dennis Hallahan is the Technical Director at Infiltrator Water Technologies.